So Kavyanjali was presented as Ananda saw Tagore through a handful of very meaningful poems in the firmament of Bharatanatyam and Kuchipudi language, supported by fascinating calligraphy by Jayant Dwarakanath in Bangla and the Telugu poems placed side by side with a subtle light green diffusing out of a black screen on the back of the stage. The presentation at the Rabindranath Tagore Centre, Kolkata, and in Lipika Santiniketan was part of the annual Rabindra Utsav by Happenings, a Kolkata based organisation of avid art lovers, professionals in different fields with the idea of presenting Tagore by acclaimed artists in and beyond Bengal. The performance was ushered in with the blowing of the conch shell, chants in praise of Lord Shiva and Vishnu and was in four parts, Nataraj, Prakriti, Maataram (Motherland) and Gitanjali. With the help of ‘The Essential Tagore’ edited by Fakrul Alam and Radha Chakravarty, the renowned Tagore scholar Dr. Partha Ghosh, and well known Telugu scholar and writer Dr. Mrunalini Chunduri, Ananda transferred the poems and songs into her dance vocabulary. Devulapalli Krishna Shastry’s evocative poem on Nataraja, “Avadharintuvu prati divvasantamdhu nitya nutana tandava nritya keli” (every evening you create a new tandavam) was presented as a pure dance number. The choice of Rabindrasangeet for Nataraj was obviouslythe most common “Nrityer taley taley Nataraj” (To the rhythm of your dance oh Nataraj, unshackle all bonds). 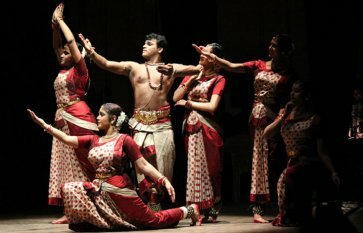 The song has been heard and performed by almost all dancers in Bengal innumerable times in their childhood as they grew up and matured but Ananda’s choreography was special. She performs as Nataraj at one corner of the stage while the other dancers diagonally opposite her dance in obeisance to the Lord. The stretched movements in “Namo, Namo” were interesting. With a painted backdrop and the Bard’s doodles and light effects, Tagore’s engagement with nature was complemented with Krishna Shastry’s poem “Nava nava Vasantha” (the choice was the Telugu poem on Vasantha) and Tagore’s “Esho Shyamal sundero” (Come oh verdant beauty) representing Varsha - another common number in raga Desh given a fascinating touch of tandava, vigorous dancing embracing Bharatanatyam. Ananda has a fascination for using different coloured odhnis (dupattas) and here she uses blue – grey ones with imagination portraying the lovely line “Bajibey kankana, bajibey kinkini.” Her solo peacock dance ushers in another common varsha song “Mono more megher sanghi” (My mind is the companion of the clouds). Generally sung in madhayalaya set to kaharba tala, the choreography of the common dance number acquired a new dimension by presenting it in a slower tempo and the diagonal presentation that had an elevation with dancers looking up in a wondrous gaze, as if towards the sky. The sthayi repeated a number of times, each time profusely adorning them with different movements, surprised the Kolkata audience at the aesthetic sensibility and intellect of someone alien to the language. Ananda’s captivating abhinaya skills, low diffused lighting laced with melody executed with the group of dancers projected time, death and life with compelling imagery. But what evoked response and admiration from everyone in the audience was the gentle solo “Ekti namaskarey prabhu” (In one salutation to thee, my God), her appealing abhinaya portraying the limitless ultimate bliss of existence. The imagery in this piece resonated in the Ekanta Seva poem. 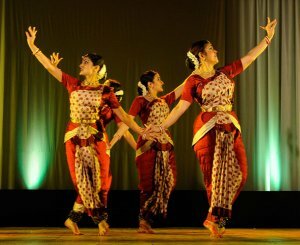 The performance concluded with the Telugu poem “Bhaktamandare bala” and “Dayavana Sharatchandra Rabindra” with which it began. From the entire performance it was evident that music dictates the movements that the body would execute. The calligraphy used Tagore’s poems and their translations. The voice over by Jayant Dwarakanath carried the perfect articulation supported by Sathiraju Venumadhav’s music composition and able singing. D. Banerjee extended choreographic dramatisation while I.V Renuka Prasad composed the jathis. Dolon Banerjee’s rendition of Rabindrasangeet could have been better. The costume of tussar and red, with white and red bangles according to Ananda gave the Bengali touch! Dr. Nita Vidyarthi is a critic of performing arts, specialising in dance, dance theatre and expressions and is a regular contributor to The Hindu, and the Statesman Kolkata in dance, vocal music and theatre. 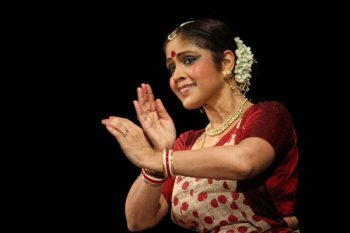 She is trained in Kathak, Bharatanatyam and Manipuri as well as vocal, semi-classical music and Rabindra Sangeet. A Science communicator, Ph.D. in Polymer Science, Commonwealth Scholar and a retired Professor of Chemistry, Nita devotes most of her time to dance and theatre writing.